The study association’s location for drinks and activities is called ID Kafee. Every Wednesday night there is the opportunity to enjoy drinks for a perfect student price of €1,- per beer from 5:00 pm to 9:00 pm. Apart from the regular Wednesday nights, there is also a Kafeest twice a year. This is a party that starts after Kafee (at 9:00 pm) and ends at 2:00 am. Also during Summercue and IO Festival the ID Kafee committee is serving you fresh beers, wine or soda. 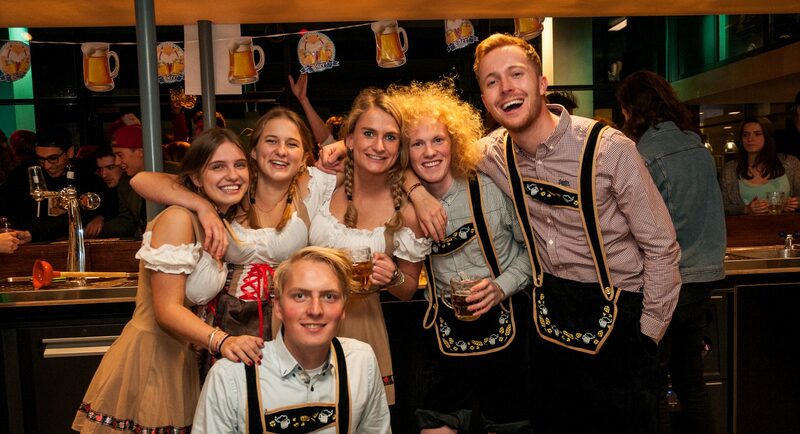 There are also theme nights like Oktoberfest, Sinterklaas Kafee, Valentine’s Kafee and Beugel Kafee. Are you going to graduate, leaving the faculty as a teacher or staff member, or do you just want to organise your drinks at ID Kafee? You can make a reservation for ID Kafee. Send an email to voorzitter-svid@tudelft.nl or call 015 27 832 37.